Bollywood actress Rekha and (R) the wife of a former Nizam of Hyderabad. They don’t call her a diva without reason. The epitome of a distinct style, Bollywood actress Rekha’s fashion sense is largely inspired by tradition. 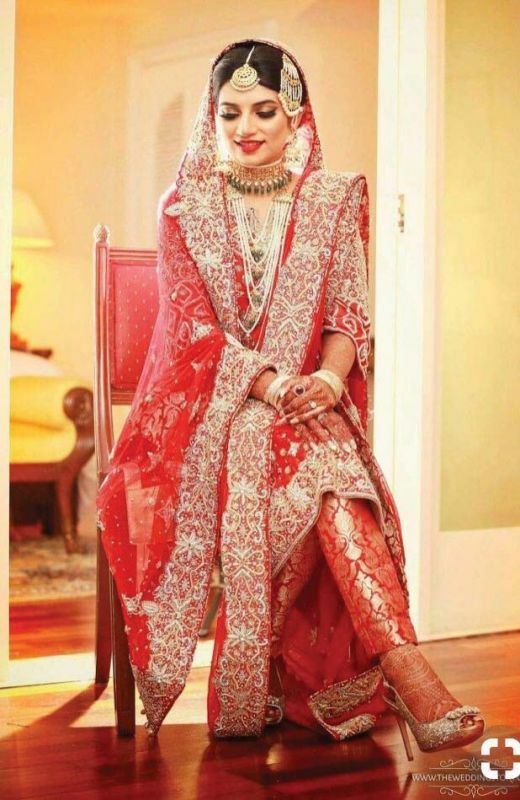 The legendary actress, who is mostly clad in dazzling Kanjeevarams with gorgeous gold jewellery opted for a slightly hatke look at a recent wedding. Modern day fashionista trolls with limited knowledge of classical fashion, have poked fun at her modern version of a khada dupatta by calling it a “pant suit.” For the uninitiated, it’s a look inspired by the Hyderabadi Chaugoshiya — a 150-year-old sartorial style essentially worn by Hyderbadi Muslim women during their nikaah ceremony. As the name suggests, the outfit comprises of Chau or four garments — a Choli (tight blouse), a Kurti (loose tunic) a tight pajama (pants) and a five meter khada dupatta that’s draped in a special way. Bengaluru-based designer Seema Malhotra elaborates, “The khada dupatta is a Nawabi outfit. It has a sari blouse which is worn inside a kalidar kurta and a churidaar. It comes with a 5.5 metre tissue dupatta whose borders are heavily layered. The duppata is tucked at the back of the churidaar and then creatively placed under the arm and draped over the shoulder. The colour combinations are varied, red and gold, pink and gold, etc. and it projects a very regal and aristocratic look.” The khada dupatta is mostly worn by Hyderabadi Muslim brides and is part of the bridal trousseau in that city. What Rekha is sporting here is a little awkward. The grace that the drape and fall is supposed to have is missing and that makes Rekha’s body-language lack elegance that she usually has. 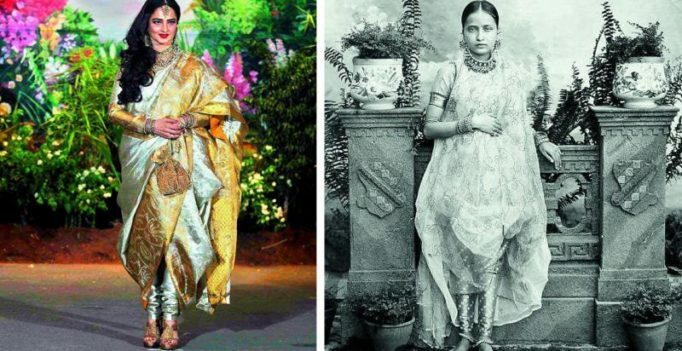 If you look at the outfit that the Nizam’s wife is wearing, it is delicate and not stiff, like Rekha’s. Also, churidaars don’t look good with heels and especially since Rekha is quite tall already, the block heels that she is wearing don’t look good. Rekha has innovatively modified a kanjeevaram white and gold sari wearing it with a long sleeved bloused and draped in the manner of a khada dupatta. She has given the kalidar kurta a miss. “This looks like a new age version. Perhaps a new way to drape a sari inspired by the khada dupatta,” adds Nida. Fashion designers constantly seeking inspiration have perhaps decided to give a modern day twist to this beautiful garment. “Anamika Khanna’s draped saris are inspired by the khada dupatta. Recently for a private wedding, I designed a beautiful red khada dupatta with a twist. I designed velvet pajamas with beautiful zardosi and brocade kurti in red and pink,” reveals Seema.